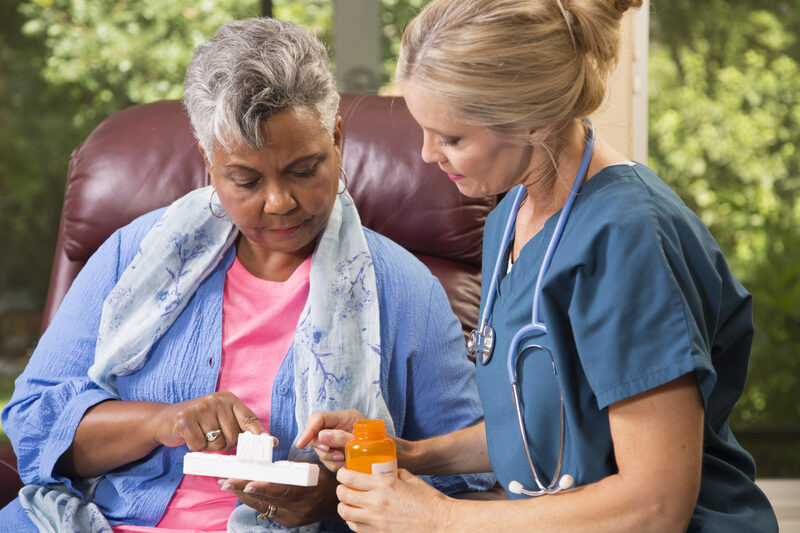 Proper medication adherence is vital for older adults in order to maintain optimum health. Unfortunately, for many older adults, it can be adhering to a medication regimen can be difficult. How big is the problem? More than 125,000 people die each year due to prescription medication non-adherence, twice the number killed in car accidents. 9 out of every 10 hospital outpatients are taking prescribed medicines improperly, contributing to prolonged or additional illness. Poor medication adherence has also been linked to unnecessary disease progression and complications, reduced functional abilities, and nursing home admissions. People who miss doses need three times as many doctor visits as others. Up to 59% of those on five or more medications are in non-adherence. While these issues present a struggle for many seniors, evidence suggests that with the proper motivation, education, and support, seniors can overcome many barriers to medication adherence. Although our caregivers cannot directly administer medications, they can assist in meeting this challenge while care taking in the home. As part of our in home care services, Hired Hands Homecare’s Petaluma home care caregivers can provide medication reminders to help clients remember to take the right medications at the right times, report any side effects to family members and the client’s health care team. At Hired Hands Homecare, we understand the potential dangers medication mismanagement and non-adherence present, especially in clients require multiple medications. Our Tri Valley at home caregivers are trained to recognize warning signs for non-adherence, watch for side effects, and record specific medication administration times in each client’s daily care log. To learn more about our medication reminder services or any of our Tri Valley home care services, contact Hired Hands Homecare today!